Your customers count on you to help protect their IT investments and to stop problems before they start. A UPS is an investment in the protection and availability of their critical business applications. You can prevent power problems by managing your customer’s UPS LifeCycle. 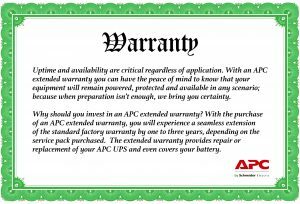 APC by Schneider Electric provides recommendations for every phase of the UPS LifeCycle, as well as selection tools to help you decide the best options for your customer. Ensuring that your customer’s UPS – and their business critical applications – are always On.